In late January 2003, CAPE ST. GEORGE participated in the Composite Training Unit Exercise (COMPTUEX) of the USS THEODORE ROOSEVELT (CVN 71) Battle Group in the Puerto Rican Operating Area. 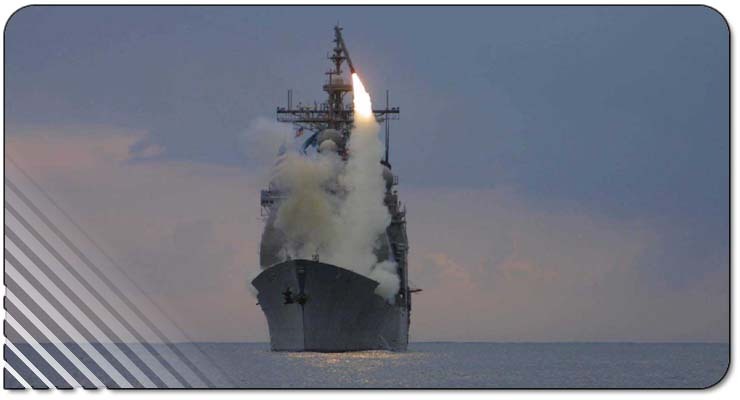 On February 4, 2003, the Battle Group, including CAPE ST. GEORGE, left the Caribbean and deployed to the Mediterranean and Arabian Sea in support of Operation Enduring Freedom. CAPE ST. GEORGE has been awarded five Battle Efficiency awards and was the 1995 winner of the USS ARIZONA Memorial Trophy Award, given by the Chief of Naval Operations to that ship in the U.S. Navy with the highest combat readiness over a two year period. She has also been awarded a Joint Meritorious Unit Commendation, Meritorious Unit Commendation, the National Defense Service Medal, Armed Forces Expeditionary Medal, Armed Forces Service Medal, and the Sea Service Ribbon (gold star in lieu of second award). 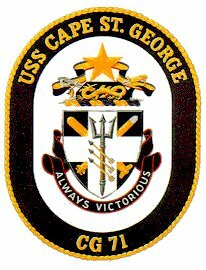 During her maiden deployment, CAPE ST. GEORGE was awarded the Commander, SIXTH Fleet "Hook ‘Em" award for Anti-Submarine Warfare excellence. While conducting work-ups for her 1998 deployment, CAPE ST. GEORGE achieved a perfect gunnery score at the Atlantic Fleet Weapons Testing Facility (AFWTF) in Puerto Rico, earning her second James F. Chezek Memorial Gunnery Award. The Shield: The shield contains the azure and gold colors traditionally associated with the Navy, while the cross refers to St. George. The trident symbolizes Naval power and CAPE ST. GEORGE's capability to fight above, on and below the sea. It is surmounted by three Indian arrows which recall the nickname "Little Beavers" by which DESRON 23 became known. These arrows symbolize the three Japanese ships sunk during the battle. Emblazoned with a torpedo, the weapon employed so effectively by the Little Beavers during the battle, and a Tomahawk cruise missile, the shield reflects the weapons of the past and present. The Crest: The crest's gold star, the modern symbol of command at sea, reflects the inspirational leadership and professionalism of the officers who commanded the Little Beavers at Cape St. George. A stylized black demi-array, which recalls the nighttime engagement and represents the capabilities of the AEGIS Weapons System, serves as the background for a dragon, symbolizing Japan and also recalling St. George. The crossed enlisted cutlass and officers sword signify the strength, readiness, and teamwork necessary to achieve victory, and the professionalism of today's Surface Warriors. They are intertwined in a ribbon in the colors of the Presidential Unit Citation awarded to Arleigh Burke's Little Beavers. Silver and gold symbolize integrity and excellence.